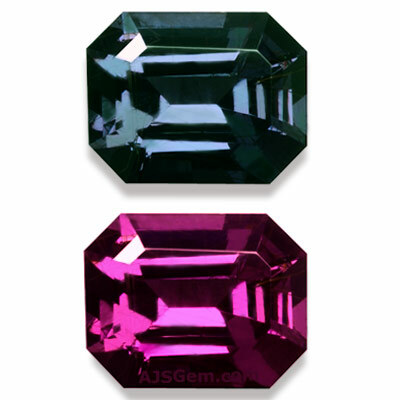 One of the long-standing axioms in the gem trade is that garnets occur in every color of the spectrum except for blue. But that hypothesis was refuted in 1998 when blue color-change garnets were discovered in the Bekily district in southern Madagascar. These unusual garnets are actually a teal blue or greenish-blue under daylight or fluorescent light, changing to reddish-purple under incandescent light. The color change is quite pronounced and these exceptionally rare garnets have become popular with collectors. Color change garnets are typically mixtures of pyrope and spessartite, sometimes with minor percentages of almandine and grossular. The color change is due to trace amounts of vanadium and/or chromium. There are actually two different colors of color change garnets found in the Bekily deposit in Madagascar. One variety is greenish-yellow to yellowish-green in daylight and an intense pink to red under incandescent light. The other variety is bluish-green to greenish-blue in daylight with a strong change to intense purple or purplish-red under incandescent light. The differences are due in part to varying concentrations of vanadium and chromium. The blue-green to purple color change garnets have relatively high concentrations of vanadium and low concentrations of chromium. A distinguishing characteristic of the Bekily color-change garnets are 4 sets of fine rutile needles, with each set at a 70 degree angle from the others. These needles are best seen under microscopic examination, but can sometimes be seen at lower magnification under high illumination. Color change garnets have also been found in east Africa (Tanzania and Kenya) and Sri Lanka. But the Madagascar deposit has attracted special attention for the unique blue stones and the strong color change. In addition, while most color change garnets are found only in smaller sizes (under 2 carats), the Bekily deposit has produced a number of larger stones. We recently acquired a parcel of high quality rough from the Bekily mine and we have cut a number of fine gems from it, including several pieces over 3 carats. But the largest stone from this parcel yielded an extaordinary 10.31 ct square cushion with a distinct color change from bluish-violet to reddish-purple. We feature this superb specimen in this month's Notable Gems. This month we feature some fine new additions to our collection. A fabulous 10 carat color-change garnet. This super rare gem is very clean and displays a strong color change from bluish-violet in daylight to reddish-purple in incandescent light. We have precision cut this fine material in a square cushion that displays bright blue and red flashes as it is turned in the light. Certified by GIA, including a Notable Letter which states that "The combination of large size, color change and high degree of transparency make this a notable color-change garnet." A very rare pink tanzanite! 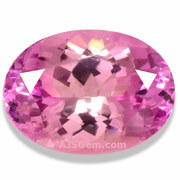 Clean and well cut, this rare stone displays a deep saturated pink. Beautifully fashioned in a portuguese cut to maximize brilliance, this is a wonderful specimen for the tanzanite collector. Guaranteed natural and untreated. 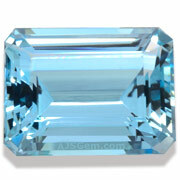 This fine aquamarine displays excellent color saturation for a medium size stone, since the deeper colors are usually found only in larger stones. Completely clean and expertly fashioned in a precision emerald cut, this fine gem will set up beautifully in your jewelry design. Guaranteed natural and untreated. 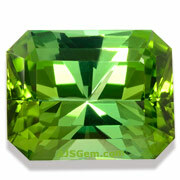 A bright green tourmaline with just a hint of blue. Completely clean and beautifully fashioned in a modified radiant cut, this fine gem will sparkle in any jewelry design. Guaranteed natural and untreated. 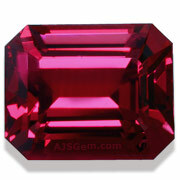 An impressive purplish-red rhodolite in an elegant emerald cut. With an open color and full fire, this fine gem will make a gorgeous ring or pendant. Guaranteed natural and untreated. A gorgeous peach morganite in a special custom cut. Saturated color and completely clean, this fine material has been precision cut in a fancy shape that will make a fabulous pendant. Guaranteed natural and untreated. The leading lot at Sotheby’s Magnificent Jewels auction in Hong Kong on October 7 will be an 8.41 ct pear-shaped internally flawless fancy vivid purple-pink diamond. It is expected to fetch from $12.8 to $15.4 million. The finished gem was cut from a 19.54 ct rough diamond mined by De Beers, with the final cutting completed in New York. The current record price paid at auction for a diamond is the Graff Pink, a 24.76 ct fancy intense pink, purchased by Lawrence Graff in Geneva in November 2010 for $46.1 million. The record price per carat for a fancy vivid pink diamond is $2.1 million per carat, set by a 5 ct diamond sold in Hong Kong in January 2009 for $10.7 million. The Tanzanite Foundation, a non-profit industry-supported organization dedicated to promoting tanzanite, will shut down its New York headquarters at the end of August. Funded by Tanzanite One, the largest miner of tanzanite, the organization has operated since 2003. Tanzanite One has decided to cut funding to the organization due to low tanzanite prices and production challenges. This is another indication of how difficult it is to make profits mining colored gemstones. Good questions, I know this can be confusing. The 16.66 carat weight is the total weight of the two stones. So each gem is approximately 8.33 cts. We always provide the total carat weight so it's easy to compute the cost per carat. The stated size, on the other hand, refers to the size of each gemstone. So in this case each stone is 14.32 x 11.12 x 9.17 mm. The most typical color for high quality untreated morganite is a salmon pink, an orangey-pink (or pinkish-orange) reminiscient of the flesh of the salmon fish. 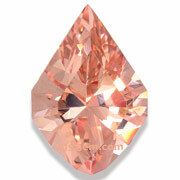 Morganite also occurs sometimes in a golden orange. We do find morganite occasionally in a pure soft pink, but this is considered a rare color and the pure pinks usually have a premium price.